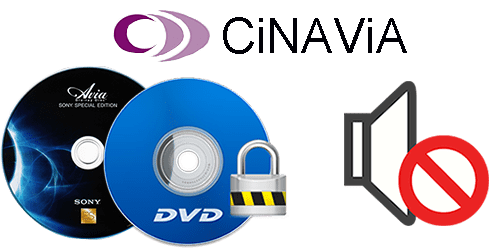 Summary: This post aims to explain what Cinavia protection is, why it matters, which Cinavia protected movies are, how to bypass this DRM protection on DVD/Blu ray and if there is Blu ray player without it currently. Anyone who has ever run into this type error during DVD or Blu ray playback might resort to an expert or Google for solution. And in most cases, they prefer to Google "how to remove Cinavia protection", for this search engine can provide you with over 90 thousand results. That being said, the majority of solutions center on Cinavia protection bypass on a PS3. If you don't play this DRM protected movies via PS3, you can stay here - a general workaround to troubleshoot your movie playback error. First of all, we get it started with what is it. Can't Rip Protected DVDs? Solution Here! * Support all DVDs: latest DVD, Sony/Lionsgate, workout, AV/99-title DVDs. * Support all protections, e.g. audio watermark, Disney Fake, ARccOS, RCE, etc. * 1:1 clone DVD to ISO image, MPEG-2 file, copy main title. 5 min to finish copy. * Rip protected DVD to MP4 MKV iPhone iPad Android with 420+ preset profiles. Cinavia is a kind of copyright protection technology for DVD and Blu Ray disc to prevent unauthorized DVD/Blu ray movies from being played. It's as part of AACS and digital rights management system with two-tier system. The first protection is a watermark that is implanted into the audio channel of the movie. The second protection is for hardware - Blu ray player, which should have the ability to detect Cinavia protected movies and check whether the movies are authorized or not. If not, the audio will either be muted or playback will stop altogether. And now almost all consumer Blu-ray Disc players from 2012 are demanded to support Cinavia watermarking detection (from wikipedia). Have to mention this DRM tech is exceedingly expensive for a studio to use, requiring a great deal of investment in proprietary hardware and licensing, plus additional licensing fees per release and even per disc. Currently, most Hollywood studios are reluctant to adopt it due to its high costs. The main user of this protection is Sony studios and distribution companies. Why it matters: when you make a personal digital copy of your Cinavia protected DVD or Blu ray movies, this DRM protection will hold you back. If you can't get rid of Cinavia protection or just bypass it, you rip Cinavia DVD or Blu ray disc with problematic copies. You insert the digital copies to device for playback, but end up with muted audio or half-way stop. So when you copy protected movies (listed below), you need to be careful. Each year will yield dozens of Cinavia movies, which can't be covered all here. Hence, here we select 2017 latest copyright protected movies and top Hollywood movies with this copyright protection released in 2016, 2015 and before. Check if your disc shelf has such protected movies. y Entertainment adopts Cinavia protection tech for its DVD & Blu ray movies. Other studios and distribution companies mainly use other encryption schemes like Disney X-project, Sony ARccOS, UOPs, CSS, CPRM, etc. So, only a minority of releases are affected by Cinavia audio watermark protection. As for the majority of Hollywood DVD releases, you can use MacX DVD Ripper Pro to remove copyright protection tech from DVDs. 1. Beat all protected DVDs: latest released DVDs, 99-title DVDs, workout DVDs, AV DVDs, Disney/Sony DVDs, Lionsgate DVDs, damaged/unplayable DVDs. 2. Remove all DVD copyright protections like Disney X-project protection, Sony ARccOS, Bad Sector, Region Code 1-6, UOPs, CSS, CPRM, Lionsgate protection, etc. 3. 1:1 clone DVD to ISO image, backup DVD to MPEG-2, copy DVD main title, without Disney 75GB oversized, video audio out of sync, distorted image, etc. problems. 4. No.1 fast speed to rip DVDs at 250-320 FPS, 5 mins to finish a full DVD copy, all thanks to Intel QSV hardware acceleration tech. 5. Rip DVD to MP4 MKV AVI MOV H264 VOB, as well as iPhone Xs/Xs Max/XR, iPad Pro, Samsung, Sony, Huawei, Nokia, Blackberry, etc. any format/device. To bypass Cinavia protection on DVD/Blu ray disc, there are two solutions you can try. Truth to be told, these solutions can't 100% work for all your Cinavia protected movies since it is constantly updated to become more and more complicated and intractable. At least, you can try them to remove Cinavia. You have nothing to lose, except some time and energy. DVD-Ranger has released its Cinavia remover - CinEx HD module several years ago. This software boasts itself as a powerful application to remove Cinavia protection from disc and make a DRM free copy of DVD movies. Thus, you can play protected movies on many devices without the annoying audio issue or playback stop trouble. Of course, you're required to download a database that's specific to the movie first. As we mentioned before, Cinavia has two parts in protection. One is for watermark in audio. The other is the Cinavia detector for hardware. So except for doing something to DVD/Blu ray disc movies, we can also take actions on hardware. By using patched firmware, it's possible to disable the Cinavia detector. Certainly, this method is only workable on a limited number of devices, not all. Cinavia is indeed an annoyance but not the end of the world. Even most BD players that support Cinavia detection, there are still some exceptions. Among them, Oppo players claim that they won't support Cinavia watermark. That sounds tempting. But its price is not low. If you can't accept its price, go for the older Blu ray player without this copyright protection (from 2010). Cannot rip Lionsgate DVD and get wrong playlist or other DVD rip errors when loading discs from Lionsgate? Find the solution in the guide where you will learn how to decrypt DVD Playlist obstruction from Lionsgate and rip protected DVD to MP4, AVI, WMV, iPhone, iPad, etc. MacX DVD Ripper Pro is the best DVD decrypter which can freely remove any copy protections from DVDs and rip DVDs to various video formats (MP4, MOV, MKV, AVI, etc) and devices (iPhone iPad Android Xbox One PS4) with original quality.